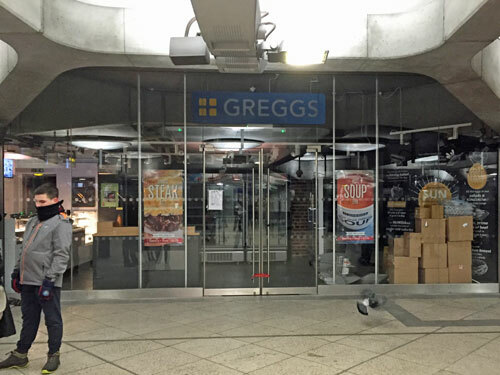 A Greggs is about to open at Westminster station. Expect considerable media over-reaction. But this isn't anything particularly special. Lots of tube stations have retail units outside the ticket barriers, and this former card shop is just one more. What's of far greater interest are locations where food is sold inside the ticket barriers, on the station proper. Here's what just one Underground line has to offer. If it's Suffolk-roasted beans you seek, this ethically sourced kiosk is for you. Admittedly it's on the mainline platform, targeting Fenchurch-bound commuters, but there's nothing to stop eager tube travellers popping over before a jaunt to Dagenham. Best of all, the daily display features proper meaty goods from an independent local supplier, including sausage rolls, baguettes and bacon butties. Who needs Greggs factory fodder when you can get the real thing from platform one? 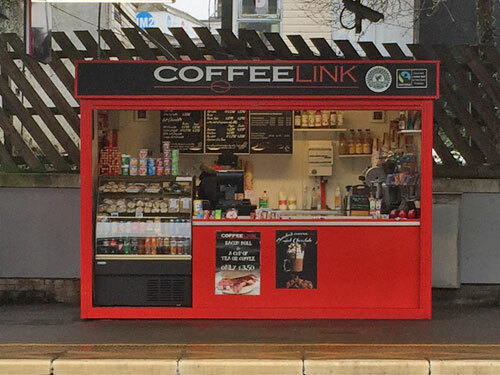 Other Coffeelink outlets can be found at Colchester, Ipswich, Ilford and Goodmayes stations, but this is the sole example on the tube. A cappuccino will set you back £2.40. 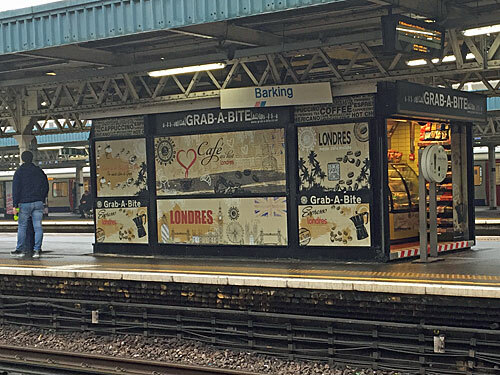 Barking really treats its users, with not one but three Grab-A-Bite kiosks on its separate platforms. This family-owned chain serves up hot drinks and comforting food, including steak slices, lamb samosas and three flavours of Doritos. I was particularly intrigued by the bright pink iced ring called a "donought", a bargain at just 90p. It's not immediately obvious why the exterior decor is so linguistically cosmopolitan when the menu inside generally isn't. Other Grab-A-Bites on the District line are located at Putney Bridge and Southfields, the latter inside the gateline, and another is due to open at West Ham. A cappuccino will set you back £2.10. Oh Ealing Broadway, you are really spoiling us! Trotting down the steps from the ticket hall brings you to a veritable food court, admittedly shared with GWR passengers, but mostly for the benefit of local tube-rs. Central line customers get the Costa (a cappuccino will set you back £2.45), but all the munchy stuff is on the way to the District. 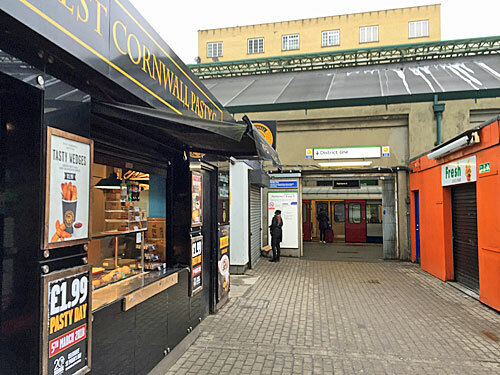 Underground users have been able to buy Cornish baked goods here for years, and today each meaty parcel costs just £1.99 because some marketing guru has decreed it's St Pasty's Day. For a more down to earth selection of confectionery, plus smoothies and granola, the two tiny kiosks opposite are your target. Those craving posh comestibles from M&S Food need to remember to pop in for their meal deal before they swipe. But chirpy coffee vendors Puccino's genuinely have the customer at heart because they have a kiosk on both sides of the barriers. Why not mull over the full range of nut snacks while your friendly barista dispenses brown gold into your slightly-comedic ribbed cup? A cappuccino will set you back £2.35. 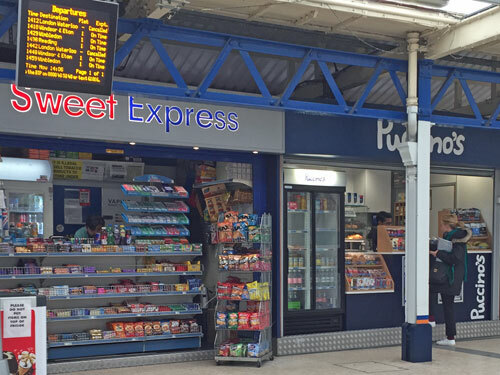 Sweet Express has the fractionally more premium location under the departures board, and offers a full range of chocolate bars and chewing gum, plus a freezer laden with currently unwanted ice creams. 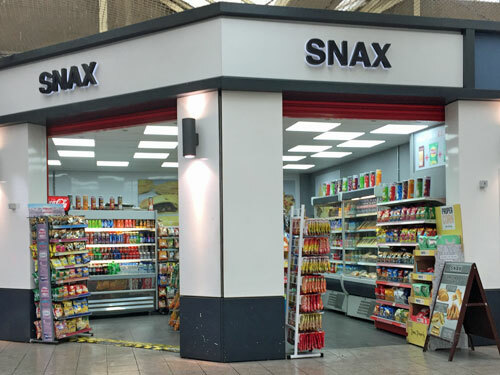 Surely there's no better example of drab generic convenience than Snax, the grab and go store tucked sideways into the District line concourse. Lovers of Haribo, M&Ms and Werther's will find much to enjoy, while sandwich and pastry devotees haven't been forgotten either. The Costa opposite is a lot busier. A cappuccino here will set you back £2.45. But it's up on the main footbridge that Wimbledon's finest in-station offerings can be found, including not one but two separate dealers offering biltong to the masses. Snoggy's is the original, offering high protein dried ostrich and beef peri peri, with newcomers Savanna jumping on the butchery bandwagon in 2015. If you've been thinking "food must only be available at National Rail stations", not so. 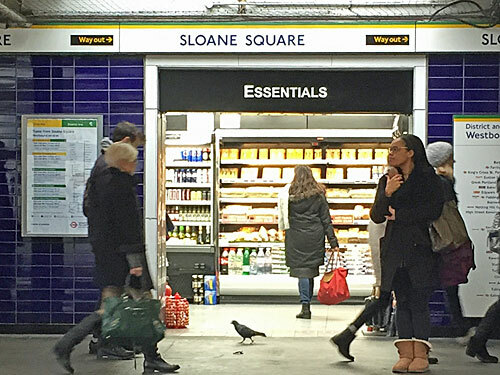 This exquisite food store is tucked away at the foot of the stairs on Sloane Square's westbound platform, offering delicacies exclusively to those travelling by tube. Step inside to enjoy a mildly overpriced sandwich, an asymmetric doughnut or an individually clingfilmed croissant. Select the hot panini option, or the £4.99 plastic tub of curry, and the assistant will warm it up for you at the till. Best of all, this place actually sells bottles of wine, in full and handbag size, plus a wide choice of lagers at three cans for five quid. Technically you're not allowed to drink them, but who needs Greggs when you can get pissed on the tube instead? If none of the aforementioned outlets has felt genuine, this is very much the real thing. 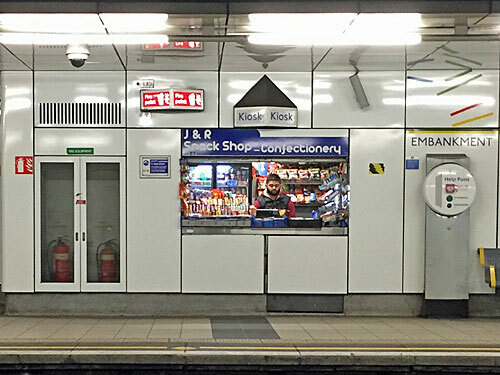 Embankment is the only tube station to retain four confectionery kiosks on its platforms, two on the westbound and two heading east. Back in the day you'd have been able to buy cigarettes and Paynes Poppets from these holes in the wall, but today's selection is rather more muted and mundane. Three of the booths are titled 'J&R Snack Shop', and cram in crisps, soft drinks and vertically-oriented chocolate bars. The fourth (westbound) space is rather larger, and for some reason called 'Embankment News' when the only printed media it still sells are copies of the London A-Z and a stack of Private Eyes. Let's end this tour where we started, back at Westminster, but this time down by the tracks. 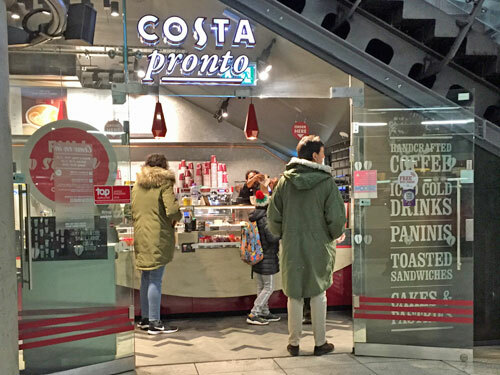 The real story here isn't the Greggs upstairs but the micro Costas already squeezed onto both platforms. One's in a new corner unit, while the other's been tucked under the escalators and is more contortedly triangular in shape, with full-length glass frontage to entice waiting passengers inside. Expect to see more of this kind of thing as TfL's commercial arm sniffs out suitable spaces for franchise-flogging. The cheapest available cappuccino will set you back £2.75, which it seems is the most expensive on the District line. But given that you can get already cakes and toasted sandwiches down by the trains, why get excited about a new Greggs upstairs?